Brand is a hot tempered guy with a lot of damage. He's an immobile mage with a lot of teamfight presence in the fact that he can win them all on his own, if he's even or ahead. Ho boasts AOE damage and a DoT passive that makes him a real pain to deal with if you can't kill him fast. He has power spikes in items like Rylai's and obviously Rabadons, but he also has pretty high early game damage as well, making him a useable support. 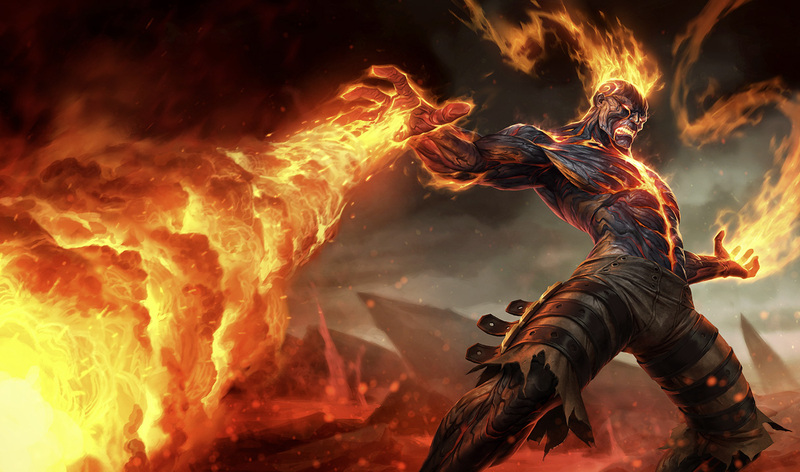 Brand's abilities set his targets ablaze upon damaging them, dealing 2% their maximum health as magic damage over 4 seconds, stacking up to 3 times, and empowering his abilities against them. The damage against monsters is capped at 320. At 3 stacks, an area about the target is marked, which explodes after 2 seconds. All enemies struck are dealt magic damage. The explosion will still trigger if the target dies to the third ability or during the delay. Brand cannot stack Blaze on enemies who have exploded in the past 4 seconds. Brand launches a fireball in the target direction that deals magic damage to the first enemy it hits. BLAZE: The target is also stunned for 1.5 seconds. After a 0.625 seconds delay, Brand makes the target area erupt in flames, dealing magic damage to enemies within. BLAZE: Pillar of Flame deals 25% additional damage. Brand sets the target enemy aflame, dealing magic damage. 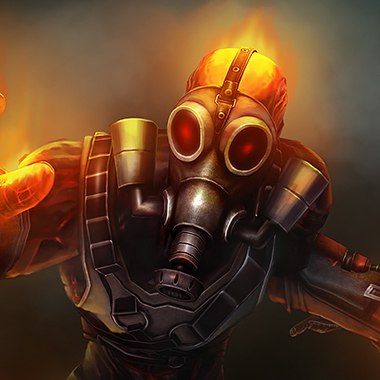 Conflagration also spreads to enemies around the target. Brand launches a fireball at the target enemy that bounces between nearby enemies up to four times, dealing magic damage each time. If Pyroclasm's current target becomes invalid, it selects a new enemy at no cost to its remaining bounces. 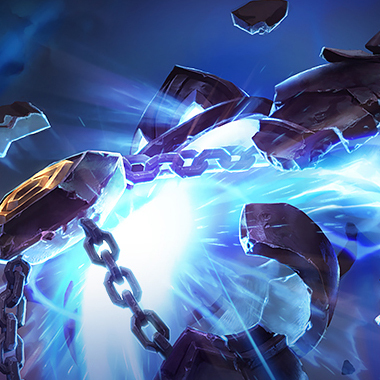 If its initial target becomes invalid and there are no other valid targets, Pyroclasm refunds 100 mana and resets its cooldown. 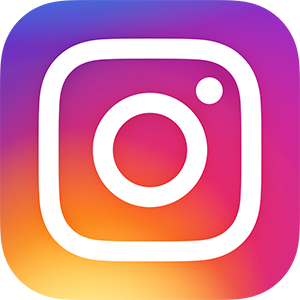 BLAZE: Pyroclasm briefly Slow icon slows enemies hit. Brand has a lot of damage, but people that can 100 - 0 him are a problem for him. 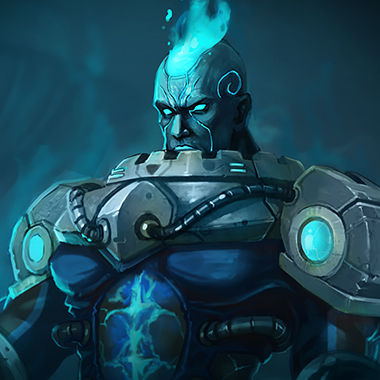 Look for opportunites to assassinate him, when one of his abilities is on cooldown, this will cause him to have lower damage until it comes back up. 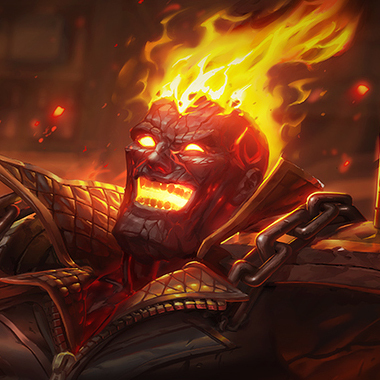 Brand is reliant on his skillshots to do the majority of his damage and apply his Blaze. Even if he uses his E to try and apply the Blaze he doesn't do enough damage without landing his skillshots. Prioritize moving laterally against him, and when his skills are down, punish him. 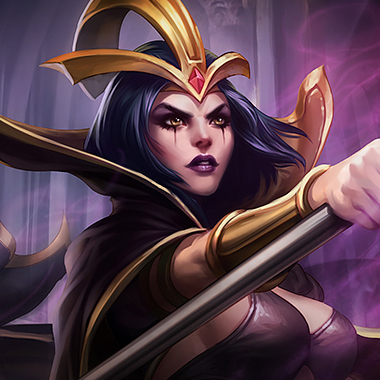 If Brand opts to use spells to farm, practice your wave control against him and hold the wave closer to your tower. He has no escapes in his kit and dies relatively quickly to ganks. Her post 6 burst is amazing. If Brand uses a skill after level 6, she's going to punish him really hard, and might even kill him for doing so. She forces Brand to respect her with the damage she brings the moment she hits 6. He'll just never walk up to Brand to trade with him. He'll smack him with Q's from across the lane and laugh while he autos the minion wave to regain mana and Brand backs to regain health. The sun is hotter than any earthly fire. 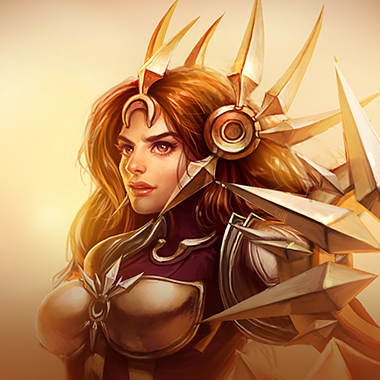 Leona will CC a squishy like Brand to death, and watch him die as her team jumps onto him. His lack of escapes being his downfall here. 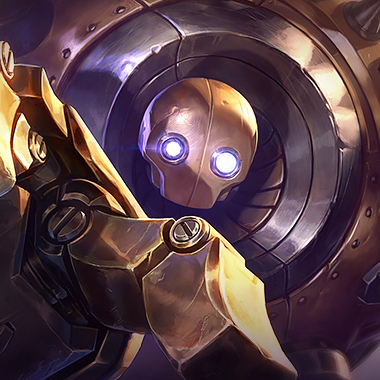 Blitzcrank CC's brand, and by the time Brand is not CC'd he's taken a lot of damage from the enemy AD Carry (Lane) or is dead (Grouping) Brand has no real way to get out of it, , so he just dies. MR. All of the MR. If he buys Void Staff, buy more MR. He doesn't do anything except magic damage, so get MR and sit on it. Then get a GA, so that if he does kill you, you can come back while he has cooldowns. Banshees is also a useful item, since it lowers the chance of him getting Blaze on you, thus lowering his damage output.